Spelling variations are not a bread-and-butter historical question, and with good reason. There is nothing at stake in whether someone writes "Pittsburgh" or "Pittsburg." But precisely because spelling is so arbitrary, we only change it for good reason. And so it can give insights into power, center and periphery, and transmission. One of the insights of cultural history is that the history of practices, however mundane, can be deeply rooted in the history of power and its use. So bear with me through some real arcana here; there's a bit of a payoff. Plus a map. 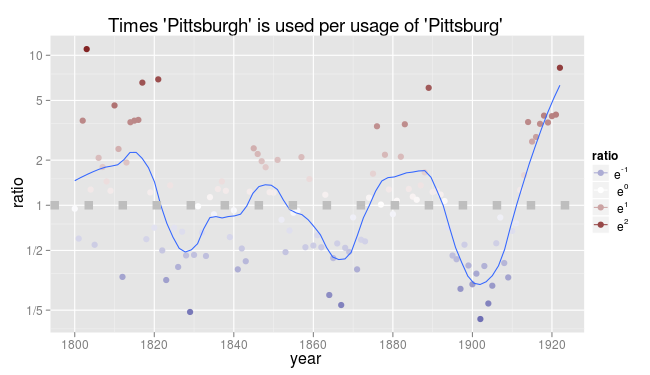 The set-up: until 1911, the proper spelling of Pittsburg/Pittsburgh was in flux. Wikipedia (always my go-to source for legalistic minutia) has an exhaustive blow-by-blow, but basically, it has to do with decisions in Washington DC, not Pittsburgh itself (which has usually used the 'h'). The city was supposedly mostly "Pittsburgh" to 1891, when the new US Board on Geographic Names made it firmly "Pittsburg;" then they changed their minds, and made it and once again and forevermore "Pittsburgh" from 1911 on. This is kind of odd, when you think about it: the government changed the name of the eighth-largest city in the country twice in twenty years. (Harrison and Taft are not the presidents you usually think of as kings of over-reach). But it happened; people seem to have changed the addresses on their envelopes, the names on their baseball uniforms, and everything else right on cue. 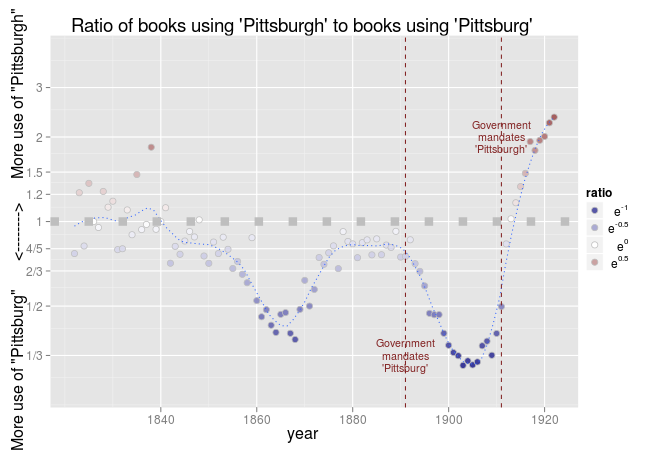 Thanks to about 500,000 books from the Open Library, though, we don't have to accept this prescriptive account as the whole story; what did people actually do when they had to write about Pittsburgh? What does this tell us about how practices change? Now, I'm interested in not the fact of linguistic change, but its dynamics. What happens when the government tries to implement changes of spelling; does everyone respond equally? This is where library metadata starts to get useful. The next place I looked for this was by stack location. Taking the headline LC classifications, do any patterns jump out? 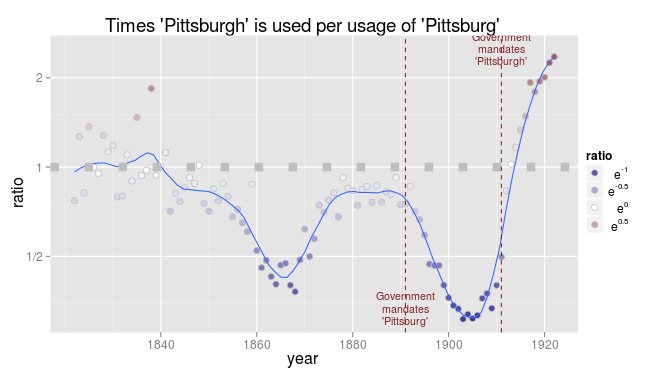 This one is more suggestive... K, the law, is curiously unresponsive to most shifts; and some areas (J, political science, and S, agriculture) seem more attached to the 'gh' spelling before 1891, perhaps because of individual institutions (the University of Pittsburgh, etc. ); and C and E, both history genres, take their time accomodating to changes. But nothing seems overwhelming. Only one of these countries flies the red, white and blue. The British don't get the memo--according to ngrams, it's not until the 1930s they make the switch for good. (The Bookworm database only goes to 1922, so we can't tell here). The Canadians, with many fewer books, show less of a pattern, but might be in between. I find this interesting; it says something about either the ability of information like lexicographic reform to travel across international boundaries, or about the ability of states to impose these constraints on others. Britons kept moving along in their own community of practice for two decades; why bother changing spelling? It's not as though they had to address many envelopes. 1) This points toward the possibility of an event that I didn't know about before. 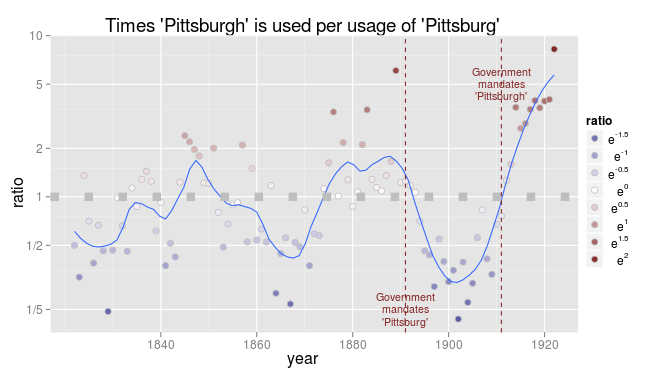 1891 may not actually be the first time the government changed its spelling of 'Pittsburgh'; something happened quickly and decisively to shift it in Washington DC in 1871 as well. Looking at book titles, I'm pretty confident this is a real pattern, albeit one the Pittsburgh sources don't mention. That mysterious plateau in the first chart from 1871 to 1891 towards 'Pittsburgh,' I suspect, can be directly attributed to whatever this is. Anyone want to put together a grant proposal to the Carnegie foundation? There's an opportunity for a major contribution to Pittsburghiana here! With the exception of Connecticut (which already had a strange predilection for the 'h'), what do we see? I would say: a path that traces concentric circles away from Washington, DC (or maybe Pittsburgh itself). I trust this enough to make a map. If we add every state with at least 20 books using either spelling after 1910, and bump up the smoothing window to six years, we can see this on a map: when do they switch over to the newly mandated spelling? 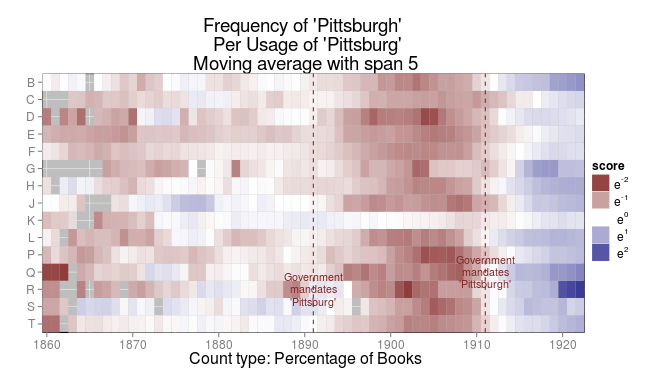 Year majority of books published in state switched from "Pittsburg" to "Pittsburgh"
(Anything that crosses later than 1922, I just count as 1923 here. And sorry for the legend; I don't know how to tell GoogleVis about years). Now the DC story is slightly less strong visually--Pennsylvania seems to be on top of the trend as well. (The story from the ground seems to be that Pittsburgundians were only too happy to go along with change). Knowing what we do, it's not unreasonable to see the practice as a joint effort of the city and the federal government. And indeed, the change does seem to radiate out from that central point through space--the farther out, the longer it takes the new practice to come into effect. (And the weaker it is when it does). Data for the 1891 transition work less well--in large part, the Western states seem to just like the simpler spelling no matter what, and likewise Pennsylvania the 'gh'. But we can make a less easy to read, but more accurate, map as well. It shows how the (log of the ratio of the) ratio of 'gh' to 'g' use changed from the aughts to the teens; bright blue (like Maryland) means it followed the federal mandates more strictly, purples show foot-dragging, and more red means that it departed from them. This, I'd argue, is pretty close to what you'd expect to see if the normative power of the federal government declines as you get further from its seat. Historians have well overplayed the center-periphery card in recent years, but they do exist; even in America, maybe the field of power declines with distance. (Can anyone think of some more terms that allow exactly this sort of application? British titles come to mind--Who says 'Sir David', and who merely "David Cannadine"?- but I don't have extensive geographic information for the UK.) Certainly, it seems like this one normative pattern does. Am I saying that this one orthographic example tells us basic things about the nature of the fin-de-siecle American state? Well, not really. (Although I probably would push it a bit farther than you'd like). This data is suggestive at best, misleading at worst; Enough for a hunch, and not much more. But, quite seriously, the accumulation of practices like this, when we can figure out how to group them together, has the potential to tell us enormously compelling things about sources of power and the patterns of imitation in all sorts of cultural spheres. Not all practices are driven by government actors; some are generational or disciplinary. 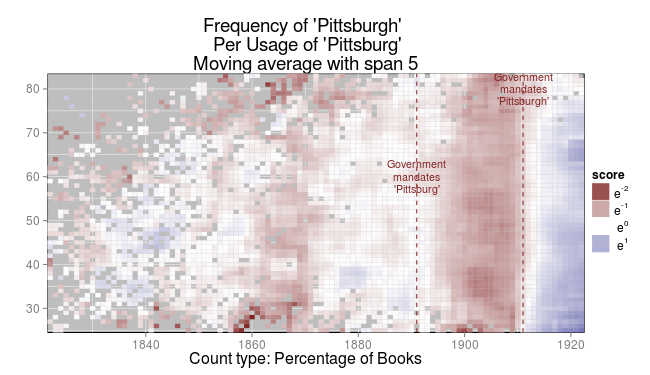 There are vast numbers of subtle linguistic ticks--like the spelling of Pittsburgh--that exist in the textual record; we can use them to see how practices reproduce, how influences spread. And they only work because they're so hard to spot that even the people using them may not think about what they're doing. 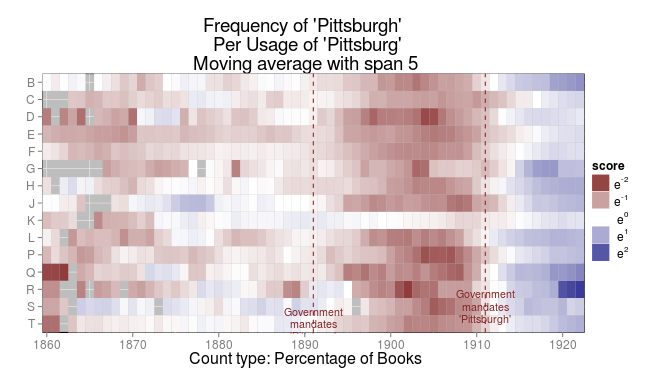 An author may remind himself about the up-to-date spelling of Pittsburgh; but it's very rare that he'd think about his relationship to the federal government before deciding which version to use. And yet, what he does reflects his participation in those fields nonetheless. These sorts of changes are like the dark matter of the historical universe; weak, tricky to spot, and not worth much in isolation; but they're everywhere. Cast a wide enough net, and we can use them for our ends. Thanks for this post. These data are indeed both intriguingly suggestive and yet maddeningly inconclusive. Such is life. Because I'm interested in circulation, my question is about how much it matters that it takes until 1923 (or later) for Utah, Oklahoma, Oregon, even California to make the switch. I guess I'm asking how the data would look overlaid/weighted by the map in the post you link, where you note that the vast majority of publishing is coming from the Northeast. 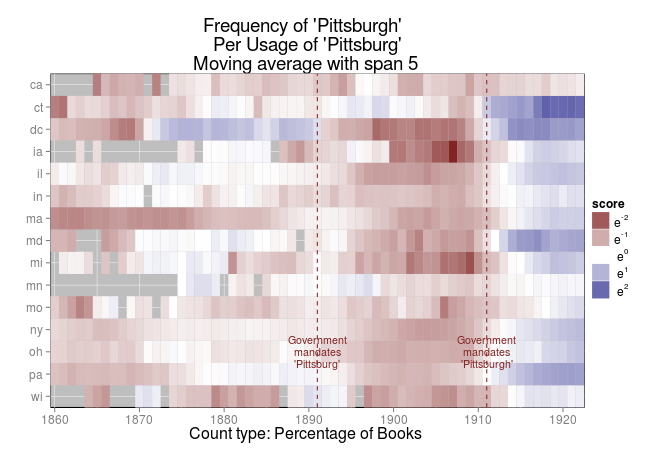 In other words, even if it took publishing outfits in the West a long time to make the switch, isn't it likely that the average reader -- even in the West -- would have been more likely to encounter "Pittsburgh" than "Pittsburg" because New York, Massachusetts (Boston), Pennsylvania (Philadelphia), and Illinois (Chicago) had all made the switch by 1914? Food for thought, another blog post, and perhaps major distractions. But greatly enjoyed these first thoughts. As you say, it's a maddening question. I can't think of a rational weigh to weight those two maps against each other. Anyway, I think I'd argue that I'm interested here in writers, not readers. (And possibly editors; publishing location doesn't say as much as I'd like about author location, after all). Even if most readers in the West would be more likely to encounter 'gh' in the teens, writers and editors there weren't necessarily aping the latest fashion out of Washington. It's not just a transmission of information problem, it's a transmission of practice one. Another catch: how much reading happens in books, anyway? A better way to do this would certainly be newspapers or letters. Yoni Appelbaum (@YAppelbaum) pointed out on Twitter the interfering effect of "Pittsburg Landing," the location of (and alternate name for) the battle of Shiloh. It definitely does play some role in spikes in the 1860s in the h-less spelling, moving it about 25% higher than it would have been. 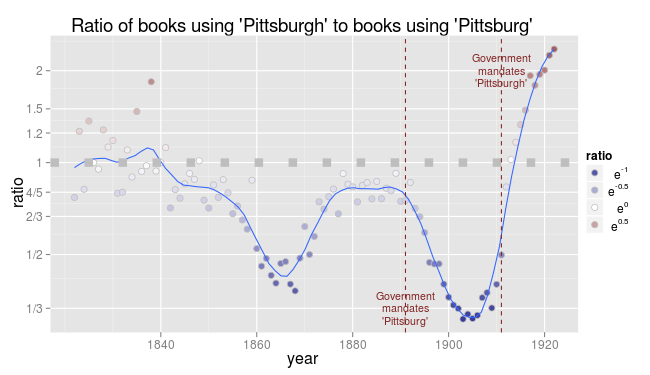 One great effect of having my research database online, at Bookworm, is that anyone can tweak the terms to test some questions like these: for example, the relative size of Pittsburg Landing or the unsmoothed numbers for Washington DC. Point taken about writers, and I agree that books are perhaps not the best place to look (they'd be a lagging indicator, right? Takes a long time to write one). So I did some very, very quick looking through newspaper databases to see what happened. This is about five minutes of work and very crude. I looked in two newspaper databases: America's Historical Newspapers and Chronicling America (through the Library of Congress). Each has selection biases, but I said it was crude, right? So the same change happens (which is reassuring in its own way). I didn't run specifics on a state-by-state level, of course, and for the moment these are just crude keywords searches with date ranges. But it's a start. As for the weighting problem, I agree that it's different for writers/editors (i.e., the production side) than for readers, but I still wonder about the effect of the mass of print that comes from just a few geographic locations. It is, as a disclaimer, a question that I have to deal with myself, and an even more pressing one -- 75% of print in the 1760s came from Boston, New York, or Philadelphia!